The Lost Artist LOVE PASSION WAR (PART 1) by Eric Hausman-Houston is a totally amazing book about an extraordinary person. It's the story of one of Israel's and the Jewish People's unsung heroes. According to the author, Eric Hausman-Houston, it's only slightly fictionalized. It's the story of his father, Fritz Chaim Fred Hausman. Fritz Hausmann was sent to Mandate Palestine at the age of thirteen 13 by his parents who insisted on staying in Germany. He found himself at Ben Shem, an agricultural high school, where boys lived and studied. At that point the war hadn't yet begun in Europe, and he kept hoping that his parents would join him in what was then called Palestine. But like many successful Jewish German businessmen and German army veterans, his father refused to believe that there would be actual danger to Jews in Germany. Also, even as things became difficult for Jews there, he still thought it better than living in primitive, poverty-stricken Palestine. The Lost Artist begins as a mystery of sorts. A young Israeli mother goes on a quest to discover who was the illustrator of her favorite children's book, "And There Was Evening." In the first part of the book, chapters alternate between her search for the illustrator and the story of a little Jewish boy in Germany named Fritz. It becomes a book just about Fritz at one point, and we never find out how they connect. I asked the author, Eric Hausman-Houston, and he said that mystery will be solved in Part 2. Fritz, renamed Chaim to help him fit in, proved to be a good student, hard worker on the farm and learned Hebrew. Hebrew wasn't his first foreign language. While still a child in Germany, he picked up a number of other languages whenever traveling with his family to other countries for vacations. Even though Chaim was Jewish, his being German set him apart from most other students. He hadn't grown up surrounded by children, which was probably part of his social problem. One day he came upon a beautiful black horse. The person in charge of the stable insisted that the horse was dangerous, but not with Chaim. That horse became his "best friend." Due to Chaim's intelligence and hard work he was admired and appreciated, and from a very young age he became part of the illegal Jewish self-defence and pro-immigrant group, the Haganah. He seemed fearless and was secretly trying to establish a peaceful, tolerant state in which his father would be willing to live. For that he even met with Arabs. Since Chaim was tall, confident and very cosmopolitan, people didn't realize how young he was. I found it hard to put The Lost Artist down. It's very well written. It's a real adventure story, especially as Eric Hausman-Houston writes about his father's World War Two army service in the British Army for which he was awarded Britain's highest medals for bravery. That's one of the reasons that Houston wrote the books. His father was listed as a recipient of the honor but never received the actual medals. When Houston tried to get them, he discovered that someone had apparently stolen them, figuring that the family would never make a request for them. The family wants the medals back and hope that the book will put pressure on whoever is now holding them and make the British Government take responsibility for the loss. 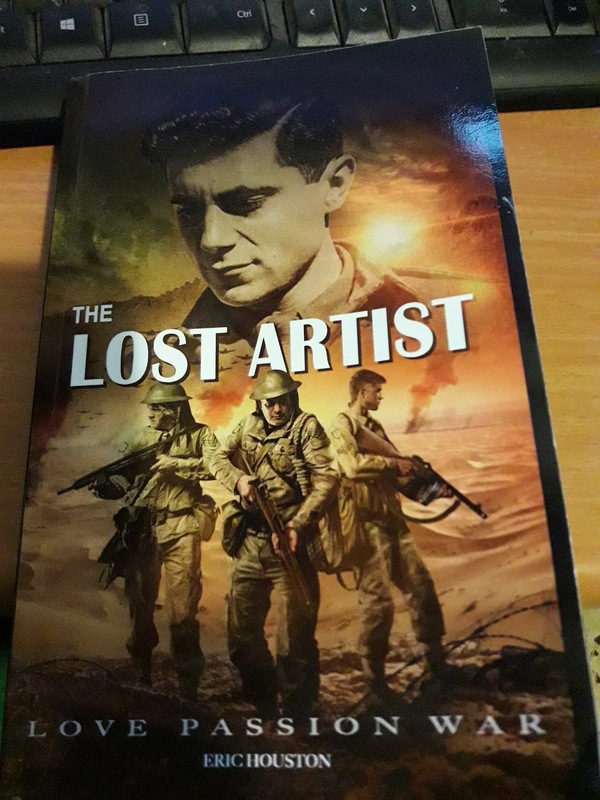 I highly recommend The Lost Artist whether buying it for yourself or as a gift for teens and adults alike. Gloria Steinem and Nancy Pelosi. Do you review books, too? a dozen Jewish newpapers, without being edited. they were praised even by people who hated me. Kotel Crumbling Sign Time to Ascend Temple Mount! Kenes Shiloh Conference #7, 5778, 2018, Sign Up! "Palestine," sic, is a "Toy!"